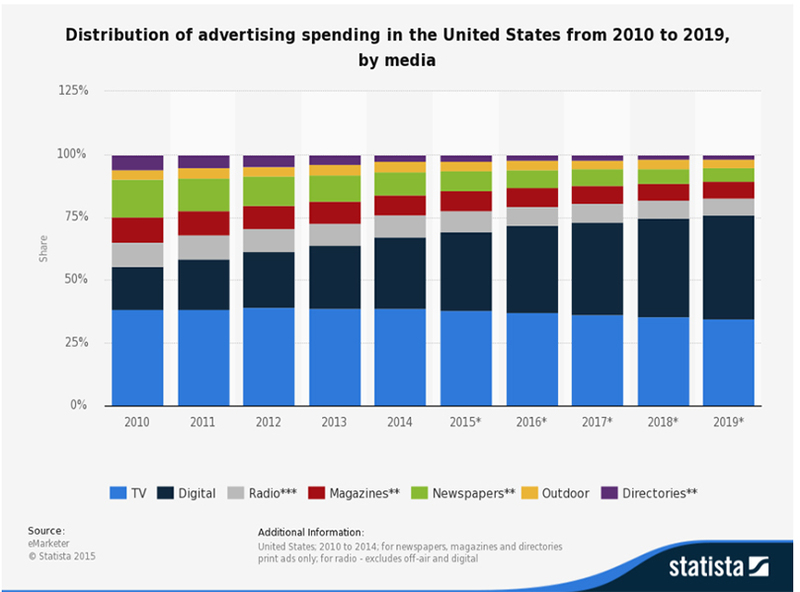 As media consumption habits evolve, digital ad spend continues to rise. Mobile advertising and digital video are experiencing explosive growth while print publications and TV continue to lose ground. These are among the key takeaways from an analysis of the state of media for B2B marketers here in 2018. 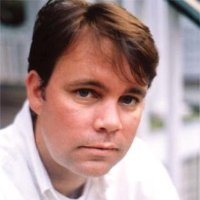 As this landscape keeps shifting, B2B organizations need to be paying attention. Let’s break down the most noteworthy stats and trends. In that piece, it was predicted by ZenithOptimedia that digital would overtake TV as the biggest advertising category by 2018. Sure enough, that’s exactly what happened. 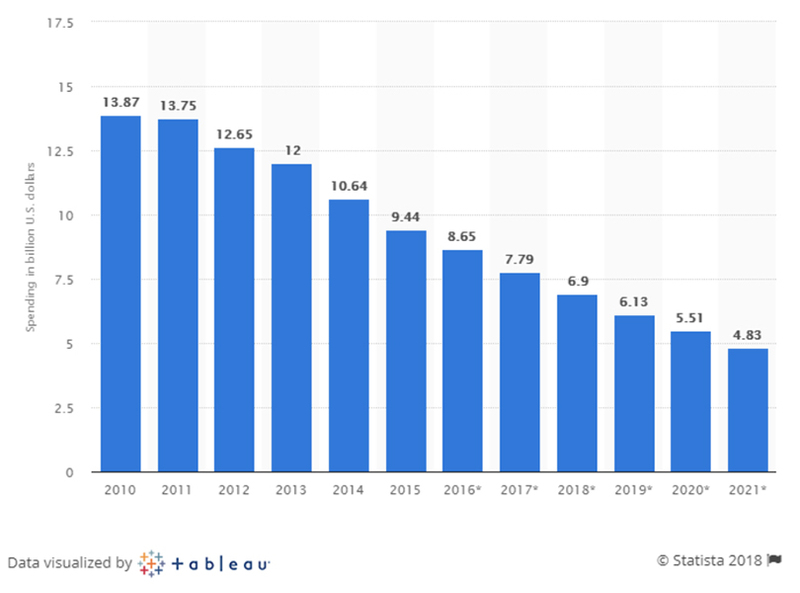 Digital ad spend in the U.S. is projected to reach $107 billion this year, according to eMarketer, while TV ad spend continues to decline. Consumers and viewers are increasingly cutting the cord and going broadband as over-the-top (OTT) content delivery and digital video keep carving out larger shares. 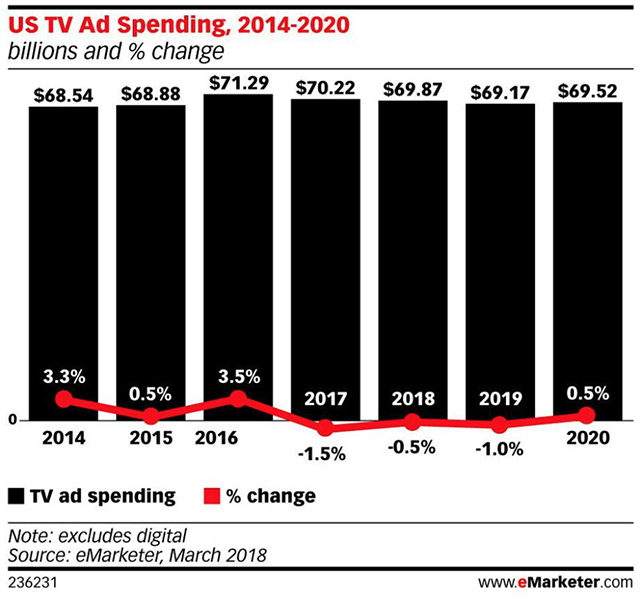 eMarketer forecasts that TV will account for less than a quarter of total ad spend by 2022. In 2017, magazine ad spend dropped by 14.8% while newspapers slid by 10.9%, per MediaPost. Zeroing in on the B2B sector, we can see from media industry revenue trends that digital advertising has experienced a steady rise as print has moved in the opposite direction. An examination of the latest Brand Audience Report from the Association of Magazine Media shows that readership for business-focused publications like Fortune and Fast Company are down significantly from a year ago. For most people reading this, the trends outlined above probably don’t come as much of a surprise. But the striking nature of these statistics hammers home a reality we all should come to terms with: interactive digital screens now attract the majority of eyeballs. Stay on top of the new media environment, and where B2B marketers fit in, by subscribing to the LinkedIn Marketing blog.